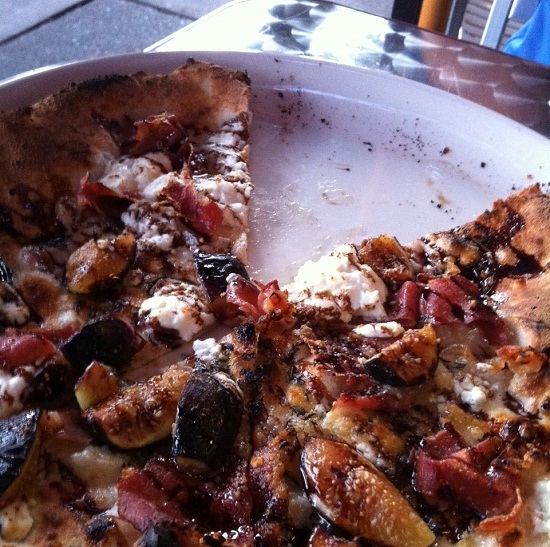 Tutta Bella’s Calabrese Pizza: Perfect crust, rosemary, balsamic reduction, goat cheese, figs, prosciutto…heaven in a slice. Sweet, salty, chewy, crunchy, crispy. 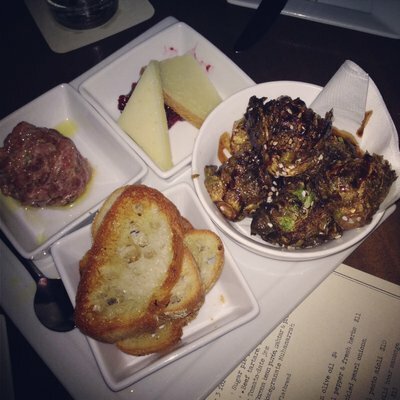 Cicchetti Brussel Sprouts: Pomegranate molasses for sweetness, caramelization, crispy leaves, char, yum. 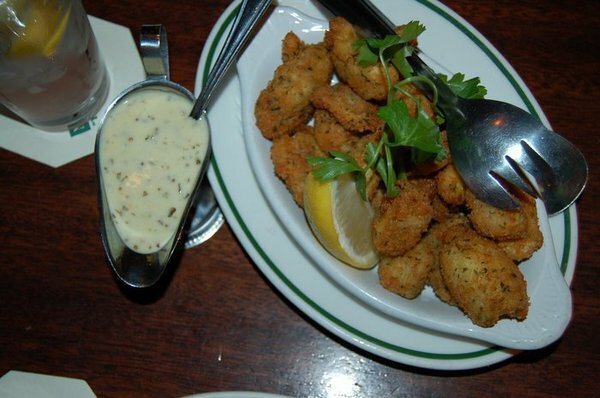 Metropolitan Grill Artichoke Bites: Perfectly fried, not greasy, crispy, creamy, vinegar tang, and amazing tartar sauce. I could eat these everyday for sure. Also fabulous ambiance at this historic Seattle steakhouse. 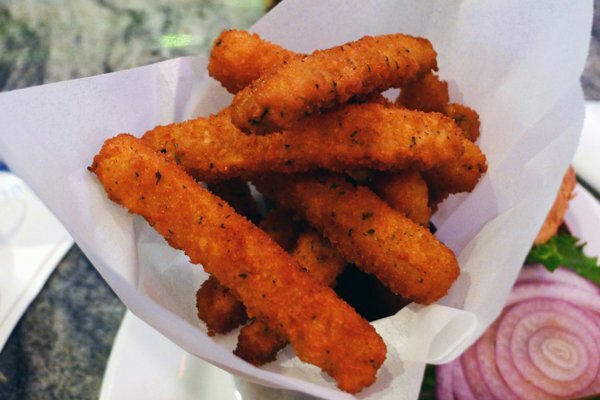 New favorite bar food? Artichoke hearts with aioli for dipping. Rays Boathouse Chocolate Molten Cake: I am a sucker for molten lava cakes and apparently don’t get them enough. 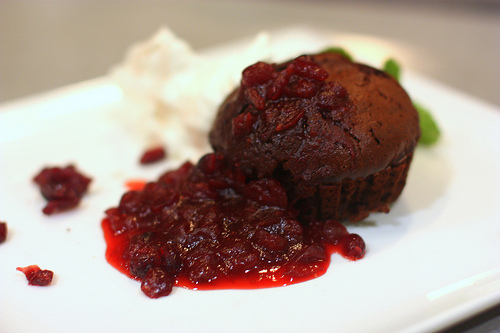 With the ice cream, hot cake, and tart cranberry sauce, I was in chocolate heaven…even on a freezing cold night. 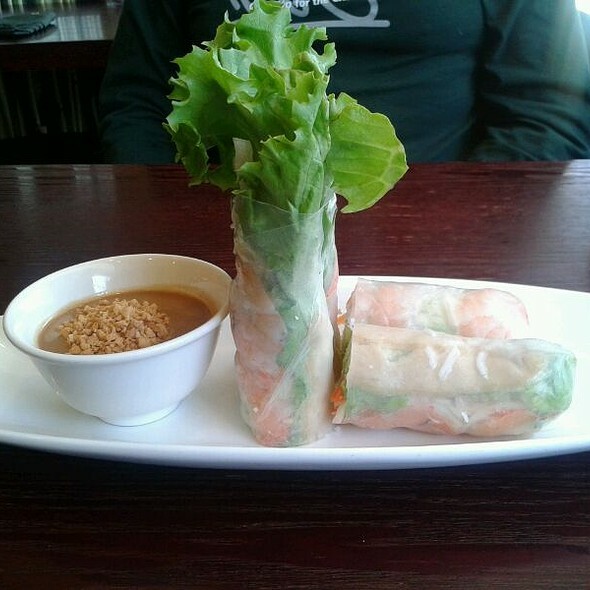 La Lot’s Bo La Lot Spring Rolls: Vietnamese food I really like and don’t go enough. I had some super fresh and flavorful bo la lot rolls after a hot yoga class one night that simply satisfied my need for crunch, cool, sugar, and spice. The pineapple fish sauce that is served as a dipper made them fantastic, while the wrapped beef was super tender and delicious. La lot rolls are so fresh and yummy! Von’s 1000 Spirits Chicken Wings: These things had everything going on. First of all, they were meaty. 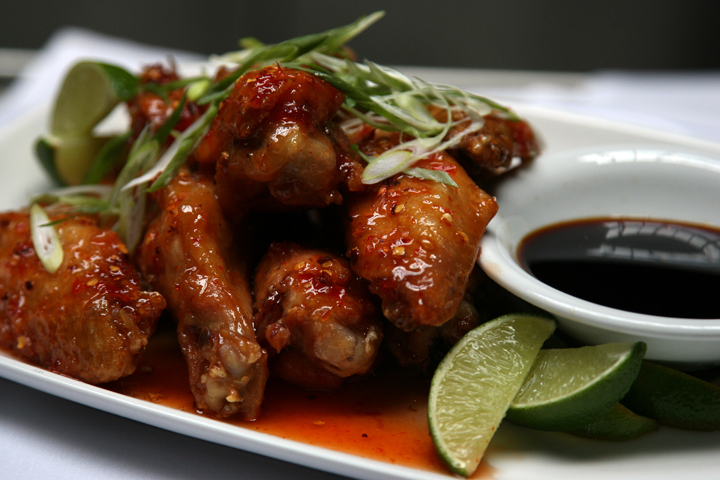 Next the crispy skin, delicious coating, and tang of the sauce put them over the top. I’m not even a wing girl but I demolished these. 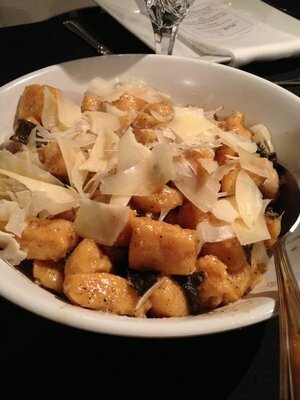 Blue Ribbon Cooking Sweet Potato Gnocchi: Maybe it was because I helped make them. Maybe it was because it was after 9pm and I hadn’t eaten dinner. Maybe it was the season and the cold weather. Maybe it was the enormous amounts of butter than went into the sauce. 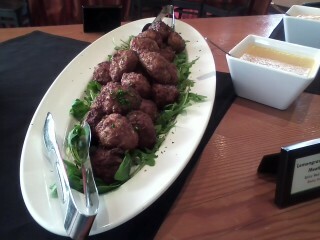 Whatever it was these were little balls of heaven. 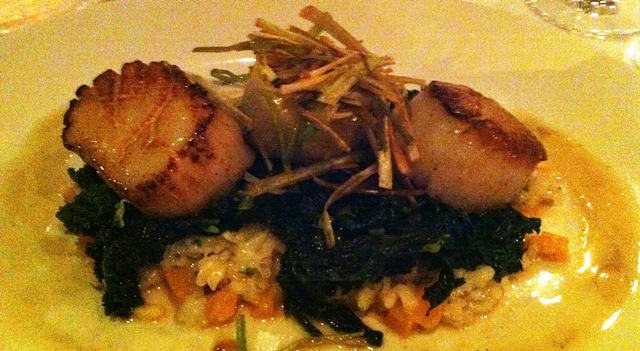 Seared Scallops at Coho in Friday Harbor: I really love scallops and these little gems were perfectly seared, enormous, and at a great price. I really wanted to go back the next night! Sitka and Spruce Veggie Mezze: I love mezzes; little tastes of a lot of different salads. Oh yes. And Sitka and Spruce put together a great plate of the all famous this year kale with feta, roasted carrots with pumpkin seeds and yogurt sauce, and butternut squash with tahini. All three were amazing!! Staple and Fancy Chocolate Hazelnut Terrine: This dessert included all good things; chocolate, chocolate, and more chocolate. 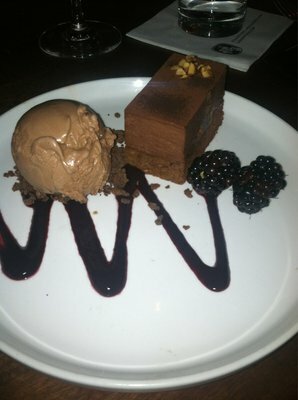 Oh but one was a super rich cake, one was phenomenal gelato, and one was killer ganache. Plus hazlenuts and blackberries, yeah! Fish Cake Factory Pad Kee Mao: It’s not a meal I have had only once this year, oh no. I could eat it on a regular basis. Bryan and I both love this dish and I even love leftovers. 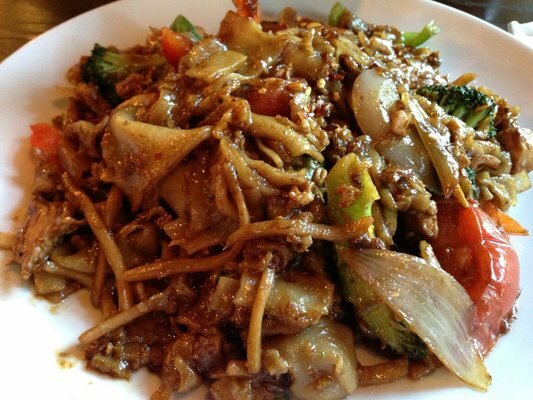 It has amazing complexity, great thick chewy noodles, ample amount of good chicken, and vegetables up the wazoo (though I always ask for extra veggies…with a wink and a smile). FareStart’s Lemongrass Chicken Meatballs with Curry Sauce: These were made by the FareStart students and staff and served at a volunteer party. I must have had ten because they were so good. Great exterior, not at all dry, great flavor, and that sauce. Swoon! 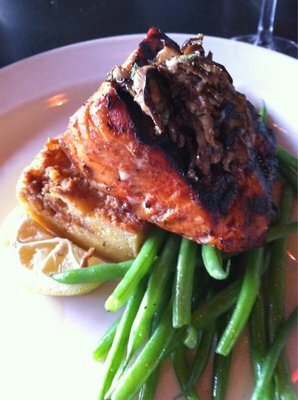 Etta’s Rub with Love Salmon: It is an instant classic every time. 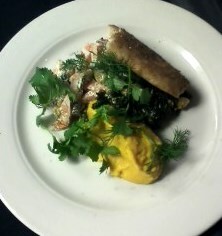 I don’t know what it is, simply grilled salmon, corn pudding, mushroom relish, greens. Great. 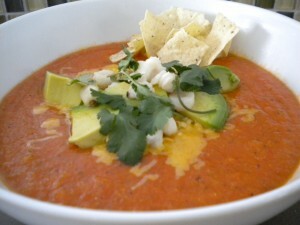 Seastar’s Chicken Tortilla Soup: For a restaurant specializing in seafood, it was their chicken tortilla soup that warmed my soul. The creaminess, the smoothness, the flavors, the toppings, everything was well done. 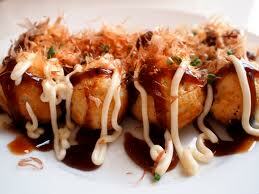 Nijo’s Sushi Takoyaki: These things are great balls of flavor. Dumplings stuffed with octopus, fried to a crisp, and then topped creamy spicy sauce. Biting into these babies are a flavor explosion in my mouth and Nijo’s knows how to do that best. Annapurna’s Chicken Mango Mazza: I now work directly next door to this hole in the wall and that is tempting on a most nearly daily basis. The complexity of this dish is the creamy mango sauce, spiced with Indian spices, while not being overly sweet or salty. 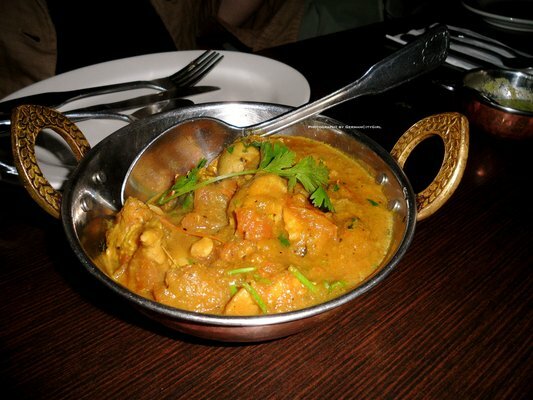 The ample amount of veggies and meat is also what I prefer to most Indian dishes. 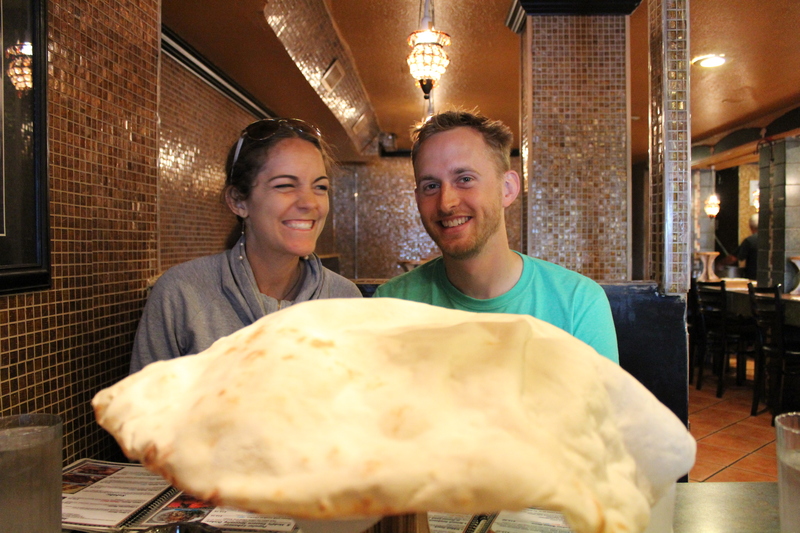 Sopped up with their great garlic naan and that is a perfect marriage. Harvest Vines Octopus on Chickpea Puree: A delicate octopus, simply spiced on top of a rich and creamy puree of chickpeas. Harvest Vine knows how to do Spanish cuisine really well and really fancy. Paired with a Rioja wine, I was in a place of pure nostalgia. 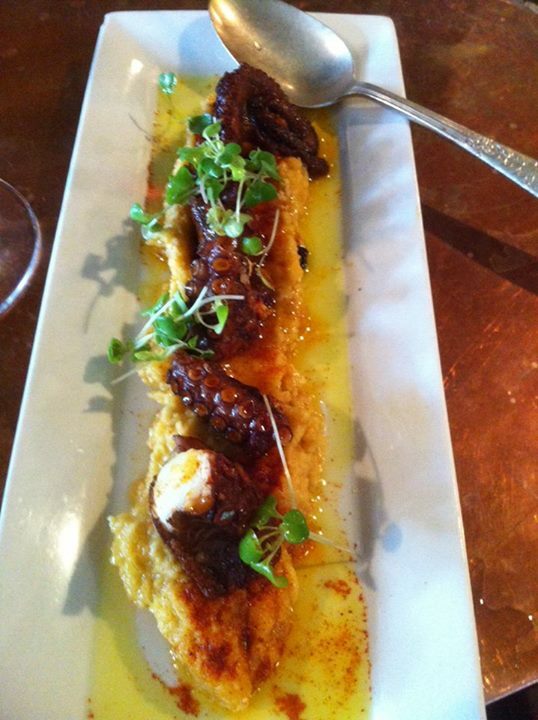 Grilled octopus with pimenton and pureed chickpeas. Nicholas’ Pita…and Everything Else: My visits to Portland now will surely always include Nicholas. They bring you out a freshly baked in-house pita the size of your head as soon as you sit down. It is soft and pillowy, charred and chewy, and perfect with all of their great Middleeastern dishes. Americana’s Tuna: The weekly special at this restaurant was one of the best meals I have had. 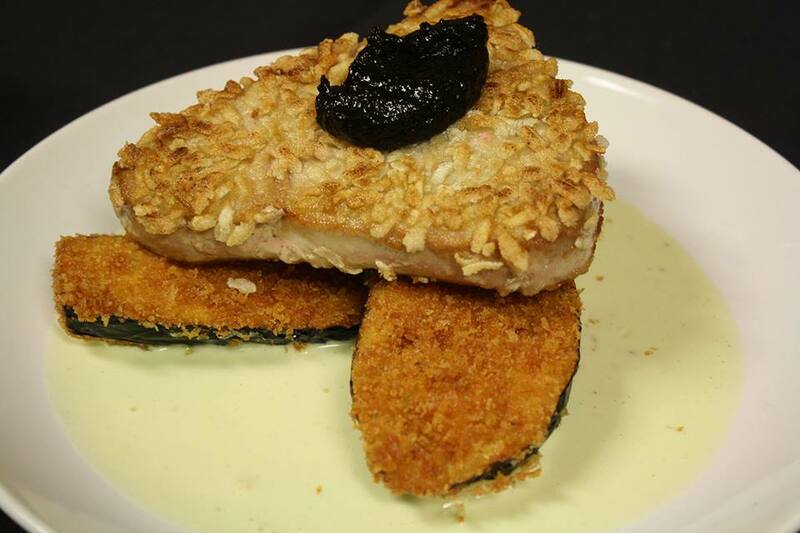 I perfectly crusted and cooked tuna steak, paired with panko breaded eggplant, nori jam, and wasabi aioli was of the hooks. RockCreek Oysters: My very first oyster (not fried). I actually loved the grilled ones, torn between the pesto one and the bacon one. Both were super buttery, HUGE, eaten outdoors in the sun with wine, and all for free. 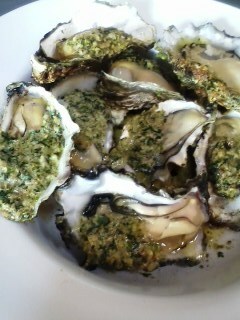 Grilled oysters with herby topping. 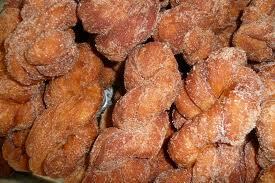 Ballard Great Harvest Cinnamon Twists: Okay, these babies are free…anytime you walk into a Great Harvest. They are light and sweet and super crunchy. They remind me of the fleurs my senora used to make in Spain….and also of Cinnamon Toast Crunch. Cinnamon twists are free and addicting!!! Burgr Bar Zucchini Fries: Okay, not in Seattle, but these crispy zucchinis were so good, so crunchy, not mushy, not greasy that they required a second order. Of course my mom’s company helped seal their win in my heart too. 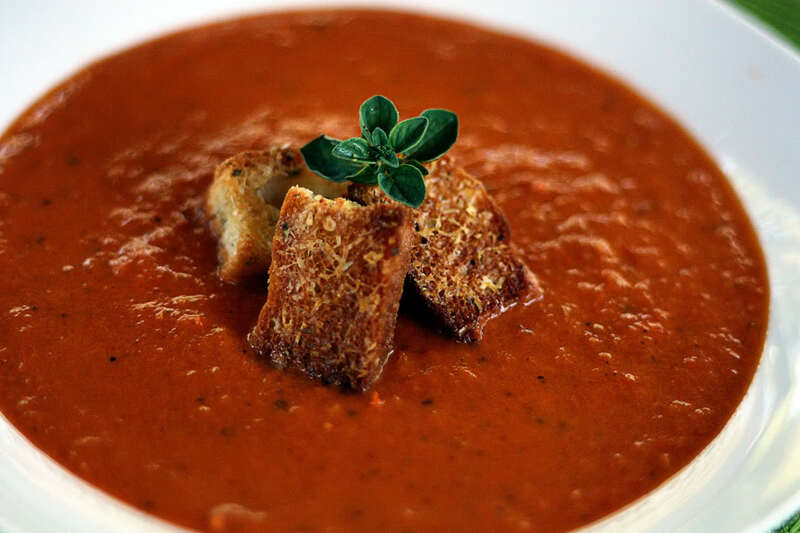 Grub Vancouver Gin-Infused Tomato Soup with Fennel Cream: This whole meal was outstanding but the starter that Bryan and I shared of a simple tomato soup was anything but simple. It was a huge bowl and so warm and delicious. RN74s Cioppino: On special at lunch, not huge but perfectly cooked and flavored. 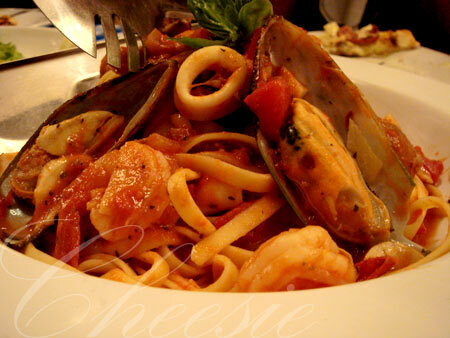 A bowl of delicious seafood and crostini to soak up the juices. 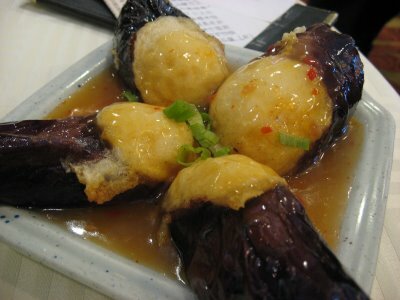 Jade Garden Shrimp Stuffed Eggplant: I love dim sum. I don’t do it enough but I know that every time I go now I will request the cart with the fork tender eggplant stuffed with savory shrimp. OMG. Looking forward to new foods in 2014!!! Previous Post Happy Holidays from Lee St.